"On November 23,1980 at precisely 19.35, it was the end of the world. 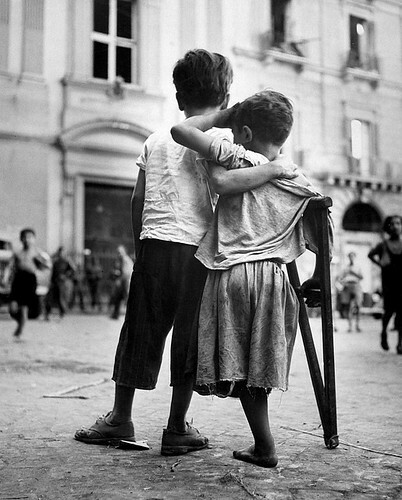 "The earthquake devastated Campania and Basilicata. "The area of Irpinia was hit the hardest, with a violent shock of 90 seconds, which culminated in a death toll of 2914." 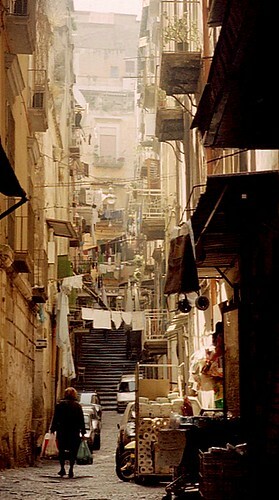 I arrived in Naples during the period of aftershocks. The comfortable and almost empty Palace Hotel, in Piazza Garibaldi, was most welcoming. At dinner I had the restaurant to myself. A few workmen were filling in cracks on the walls. 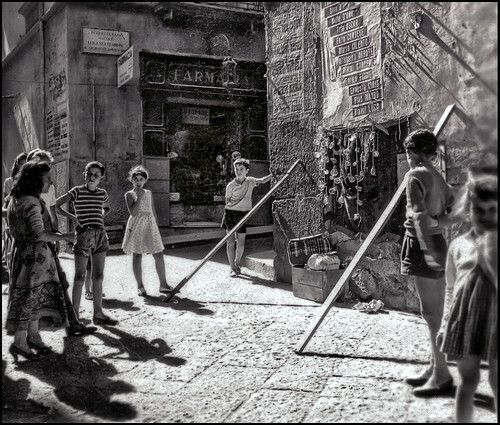 Along dark and narrow Via S.Biagio d.Librai, in the slummy Spacca quarter, fires were lit in the street; and beside glowing embers sat stallholders selling everything from smuggled cigarettes and live eels to imaginatively carved toy castles and sensuous angels. The occasional Fiat struggled to squeeze past the crowds without knocking over the precariously balanced fruits and cheeses or the scaffolding holding up some of the buildings. 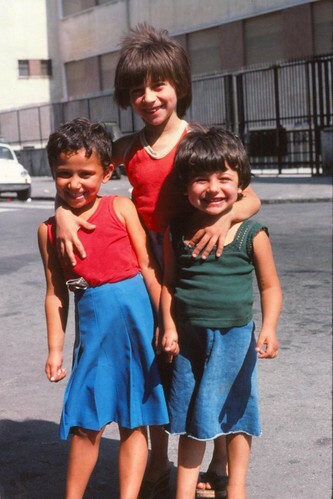 Three youths danced along the street to the tunes on their cassette recorder. One stopped to show me some hashish and ask if I wanted to buy any heroin. Down Via Mezzocannone, beside small arcade rooms full of 'space invader' machines, two youths speedily removed the spare tyre from a car and darted off into the darkness. In a poverty stricken little wine shop off Corso Umberto I, the owners, a young husband and wife, were sitting a little dejectedly beside a bucket of cinders. They said they were frightened. They had had to abandon their house after the earthquake as it was unsafe. 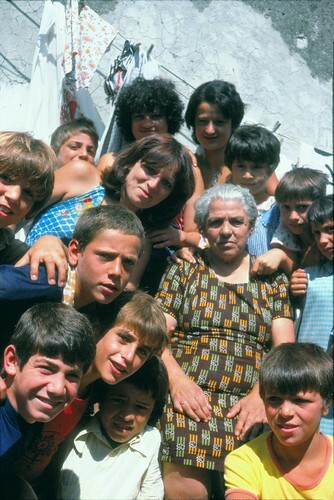 Now they stayed with friends outside Naples. Their son did not go to school as the schools were being used to house homeless people. They wondered what had caused the earthquake. Was it perhaps because some great stones under Naples had fallen downwards? Did we get earthquakes in England? An elederly Italian-American lady translated the couples' words for me. She whispered in English that the couple were wealthier than they pretended; and that I should look out for thieves. Off Via Roma I came upon an ancient tenement block, the top part of which had tumbled to the ground on the day of the 'terremoto'. I could see the framed pictures on the cheap wallpaper of a living room on the top floor. 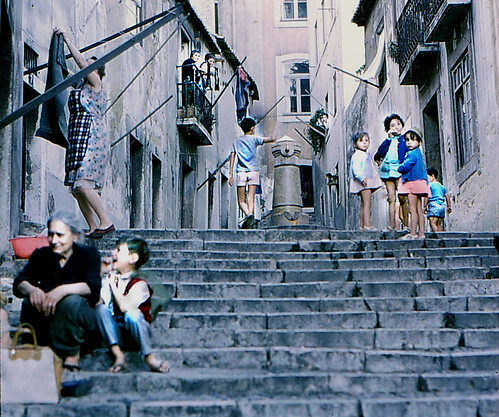 Off Corso Umberto I, I came upon a family sitting out in the street. They said they were too frightened to go indoors. Wandering around Naples in the days that followed I was never bored. On Via Nuova Marina, a Volkswagen pulled up alongside me and the driver, claiming to be a German tourist, related how his car had been broken into, his possessions stolen, and his petrol drained off. He had been to the police, but they had simply told him to see the German Embassy in Rome. He had travelled to Naples for a holiday but now could not wait to leave. Somehow I had the feeling he was some kind of confidence trickster. In Naples so many people live in tiny one room flats always decorated with dull grey or brown wallpaper and always dimly lit. Into these rooms are crowded the bed or beds, the dining room table, the ancient wardrobe, the grandparents, various fat women in black, numerous bambini, and a picture or statue of Christ. In one dark room I glimpsed a middle aged lady with her son seated on her lap. Her son was in his twenties and was mentally defective. 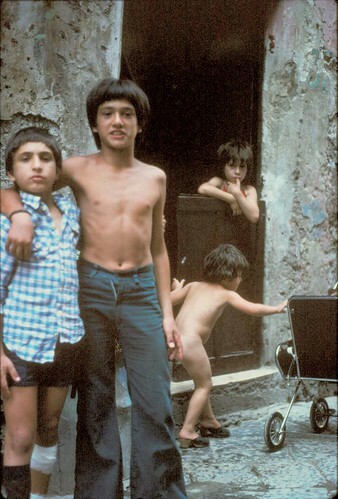 People work hard in Naples, even the children. In oily little garage workshops small boys are lying under cars working with spanners. In and out of bars scurry little ragazzi carrying coffees to be drunk in neigbouring shops and workshops. At busy crossings tiny bambini in thin jerseys clean car winscreens in an attempt to earn a few Lire. 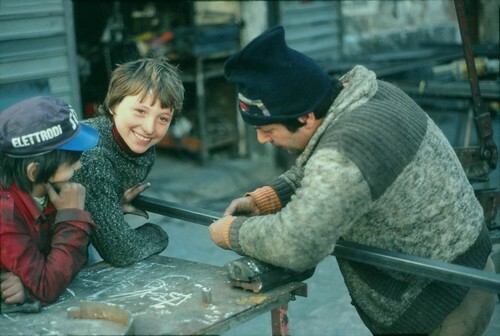 In the kitchens of restaurants, in the hairdressing salons, in the metal workshops and in the open air markets, children work from morning until night. In Da Giovanni's trattoria I sat at the table of a beautiful-looking Italian family from a village in the middle of the earthquake zone. They were frightened to go back to their village. They insisted on paying for my meal and the proprietress came to thank me for eating with them. 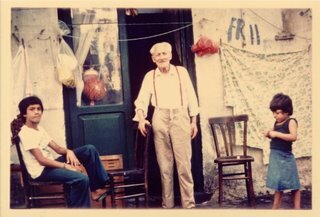 In Piazza Garibaldi one evening the son of the owner of the Ristorante Ettore rushed into the street to greet me and to invite me into his empty restaurant. As I ate my beefsteak with fried eggs and spinach I watched clowns perform a ballet on a TV screen. In my favourite Pizzeria on Via A.Poerio, which was always crowded with proletarian Neapolitans laughing and arguing, young Franco, Raffaele and friends told me about Queen Elizabeth's visit to Naples. They had loved the regal splendour. They talked of Neapolitan beauty and Neapolitan pizzas. I agreed and sank my teeth into the thick mozarella cheese, tomatoes, anchovies and bacon, and drank some of Nino Nasti's red wine. One sunny morning, when the sky was a cloudless blue, I sailed out past the US naval ships, past white yachts, past the island of Procida to the island of Ischia. In the best restaurant in the harbour I enjoyed steaming spaghetti with clams. Later, at Pozzuoli, where Sofia Loren was born, I watched fishermen sell their catch. Then I tucked into mussels, squid, and prawns. How polite the people had become! Perhaps it was the cumulative effect over the years of cholera, earthquake and an absence of tourists. Carmine and Vitale, whom I met at Capodimonte, took me on a tour of their district. Naples is Baroque grandure, spectacle and mystery in a Fellini sort of way. It is giant black funeral coaches; it is the Camorra; it is angels. I asked an Englishman, whose daughter had married a Neapolitan, why the people of Naples were so reluctant to make money from tourism. "The Southern Italians have sunshine and beautiful scenery," he said. "They don't want much else." Reportedly, the Naples-based Camorra has links to Jewish mafia gangs in the former Soviet Union. Reportedly, the Camorra has been under investigation for the smuggling of nuclear material. Prof Scaramella is from Naples and "has a deep knowledge of nuclear materials". Scaramella 'was involved in an investigation on the illegal dumping of waste by a camorra clan in a lake of the Herculanum area'. Shoot out in March 2004: four Camorra members involved. 'They did not shoot at Scaramella to take him out but apparently shot at the two cops who were there to meet Scaramella for reasons as yet unknown. Scaramella flew into the UK on easyJet flight EZY3506 fromNaples to Stansted Airport on October 31 2006. Litvinenko worked for the Jewish Russian mafia, MI6...? "Also of interest is Litvinenko's visit to the London office of the British private military contractor Erinsys, Ltd., which has been linked to Iraqi National Congress neocon agent of influence Ahmad Chalabi."